Update March 6, 2018: To date we have raised over $80,000 and have spent approximately $60,000 fighting the versions applications submitted over the years (mostly on lawyer and planner fees, see below). We now seek $50,000 to cover the necessary lawyer expenses required to attend Stage 1 of the OMB process. Approximately $10,000 from the funds raised 2013-2017 carry over to the our OMB Stage 1 fund and an additional $12,500 raised since the beginning of the year mean we’re almost half way there. We will host a community even on March 22, 2018 where a detailed breakdown of the funds raised to date and how they were and will be spent, will be presented. As always, feel free to reach out to us with any questions. The Preserve Thornhill Woods Association has been regularly appealing to our community to donate money to help fund our association. As you all know, we are a volunteer based, “not for profit” rate payers organization and we rely 100% on donations from our community to fund all of our costs. A number of your have asked us to provide a summary of our current donations along with an explanation of how this money has been spent since we formed our association earlier this year. The PTWA board’s Treasurer provided a summary of all expenditures and we have transferred this information into the graphic above. There are a couple of things to note. First of all, all board members and PTWA volunteers work on a volunteer basis only. Secondly, the bulk of our donations are currently being directed towards paying for our lawyer and our planner. Both of these professional resources are vital to helping us object to the Jaffari development application but come at a very high cost. We are using these resources very sparingly but each time we make a request for donations, it is usually to help cover legal and planning fees. It’s disgusting that we have had to hire expensive professionals to defend the city’s own VOP 2010 Plan of Record, but had we not done so, our neighbourhood would have been completely at the mercy of the applicant, their lobbyists and their hired developers. While the Jaffari development application concerns lands located in Thornhill Woods, this development application has serious implications for all of Thornhill. If every family in the greater Thornhill area would reach into their pockets and donate $200, we would certainly have more than enough money to defend Thornhill against this serious threat. We also know there are a few families who could donate quite a bit more than this amount along with local businesses who could easily sponsor our association through a donation of money or “pro bono” services. 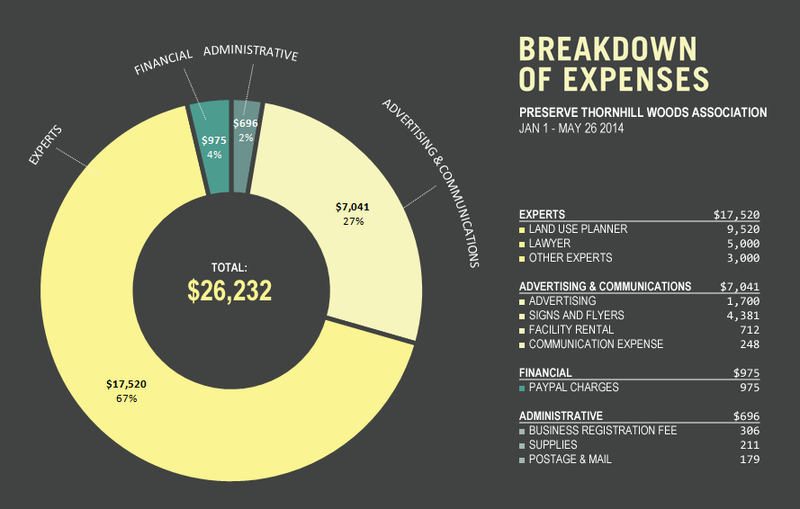 So please consider giving The Preserve Thornhill Woods Association a donation. We promise to spend this money wisely. If you are a business that wants to donate, please reply and request a sponsorship package. A few hundred dollars is really a small amount to invest in your own quality of life.